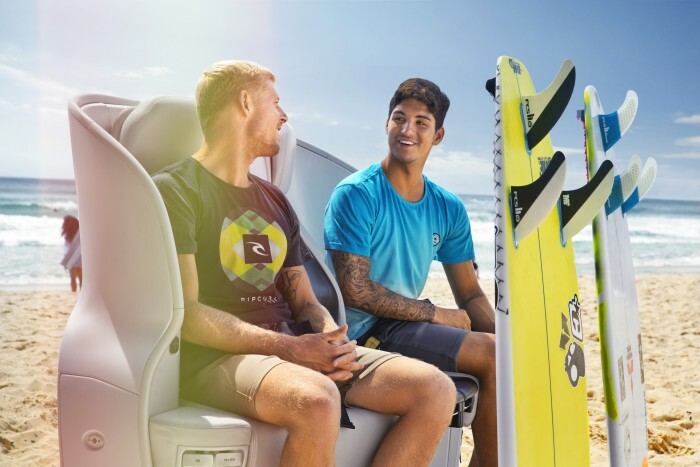 Air New Zealand Safety Safari Video And Surf Contest Has Nearly One Million YouTube Views – Sports Techie blog. The new Air New Zealand Safety Safari video starring superstar and legendary surfers from around the world filmed at three of the top surf breaks across three countries is already a marketing hit. It was released on May 13, 2015 and is fast approaching one million views on YouTube. Air New Zealand created another viral video with the help of the world’s top surfing athletes, Sir Hollywood, the bulldog that surfs and via creative board messaging about inflight safety tips. The Sports Techie community blog readers and followers that fly frequently, travel overseas and use digital technology on an ANZ Boeing plane or another airlines, will want to watch this helpful video for the simple safety tips, epic surf shots and entertaining messages delivered by expert surfers that could save your life. With a catchy title like “Air New Zealand’s Safety Safari”, viewers are immediately drawn to learning more about this campaign featuring 2014 world champion Brazilian Gabriel Medina, three time world champion Australian Mick Fanning, American big wave legend Laird Hamilton, popular American surfers Alana Blanchard and Anastasia Ashley plus some of the greatest surfing talent from Asia and New Zealand. The compelling safety video was made in Malibu, USA, the Gold Coast of Australia, and at Raglan and Piha in New Zealand, three of the most serene and under the radar surf destinations on the planet. 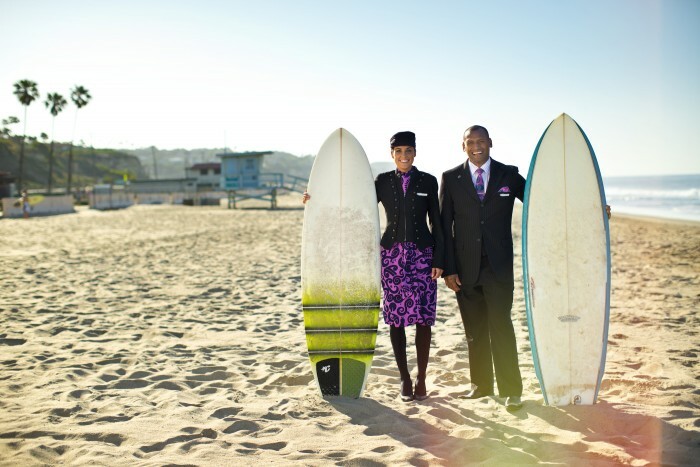 Air New Zealand’s New Safety Video Features Legendary Surfers. 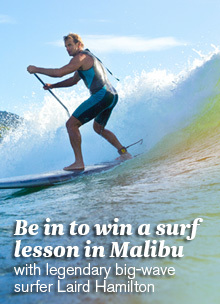 To celebrate the launch of the Safety Safari video, Air New Zealand is giving viewers the chance to win a surf lesson for two with legendary big-wave surfer Laird Hamilton in Malibu, including round trip Premium Economy airfares to Los Angeles, 5 nights 4-star accommodation in Santa Monica, and a rental car for 5 days. Answer two questions, provide some personal data and enter the contest via this link here. The fan experience competition closes: May 28, 2015. Sports Techie, The sport of surfing has grown in popularity by leaps and bounds over the past few decades producing international and local, men and women champions. I like the videos use of surfboard, SUP boards and skateboards, and the casting of last year’s world surfing champ along with a Sports Illustrated swimsuit model that surfs with the greats. The Malibu beach skyseat and Gold Coast spaceseat certainly are popular seats. Animals are a major component of our community so Sir Hollywood, the surfing Bulldog in the video probably deserves his own AIR NZ campaign. If you are wondering what the name of the song in the video is it came out eight years ago by Peter Bjorn And John, and is titled, Young Folks. Some facts I found interesting include, no electronic cigarettes can be smoked on the plane during flights. Lifejackets are easy to put on as told by Fanning into his GoPro mounted on the tip of his board while surfing the Aussie Gold Coast. I did not know a map of aircraft exits could be graphically shown on the bottom of a surf board. Finally, how cool was it when the surfers lit candles for the escape pod lighting and flew them into the sky as an example of aisle lights that passengers can follow in case of an emergency landing. In terms of electronics, Ohno, the number one Japanese surfer tells ANZ flyers it is OK to use lightweight handheld devices at all times but transmissions from cellular, Bluetooth and Wi-Fi must be turned off by selecting flight or airplane mode, a standard task for flying in general. In Air New Zealand economy and premium economy, no cords are allowed between the seat in front and the rider during takeoff and landing. I am guessing first class seats must not have these restrictions. If you win the contest for surf lessons from big wave surfer and sport legend Laird Hamilton, given in Malibu, ask if you can try a foil board lesson because watching him ride one on a massive wave in New Zealand is breathtaking and I love the sports tech invention. I was an official blogger at the Global Sports Forum Barcelona in 2012 and to this day, I am bummed I did not get to meet Hamilton in person and attend his surf camp for the local kids so if you are the winner and meet him, please give a shout out from me to Liard. Well done Air New Zealand’s Safety Safari #AirNZSafetyVideo. Keep up the fresh and entertaining adverts.